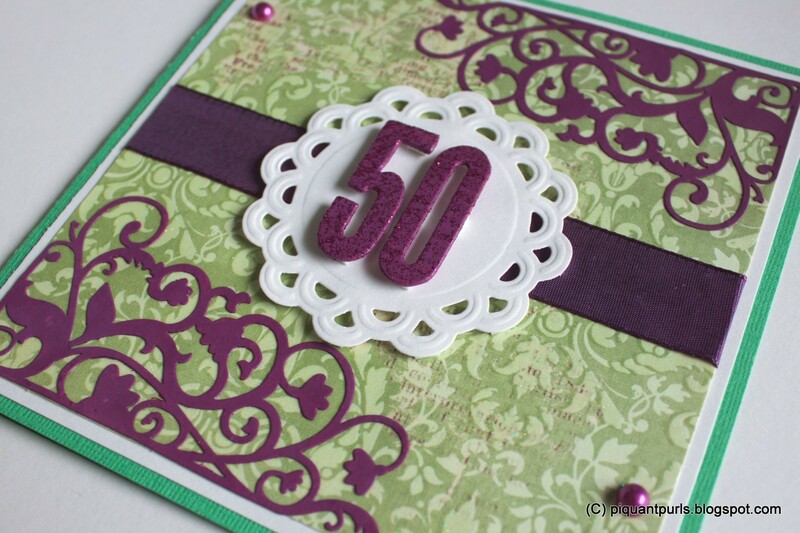 Simon Says Anything Goes again; this time a birthday card for a 50-year old. 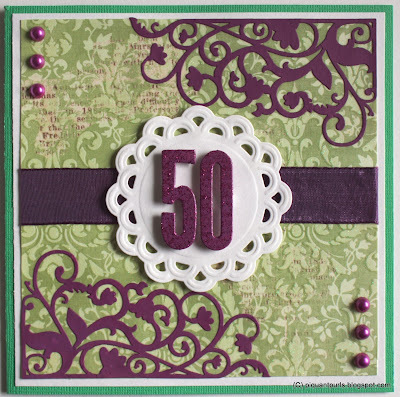 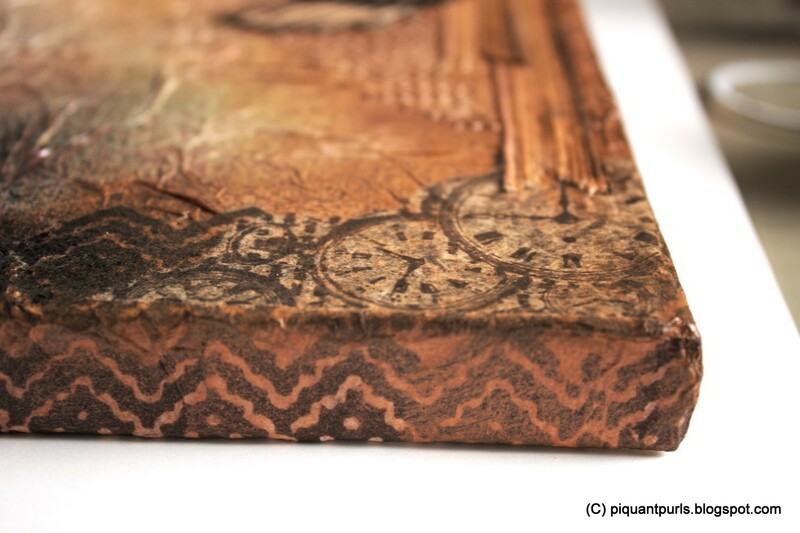 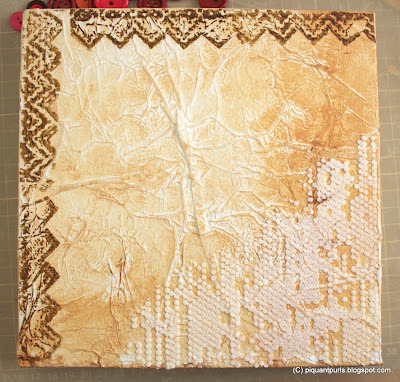 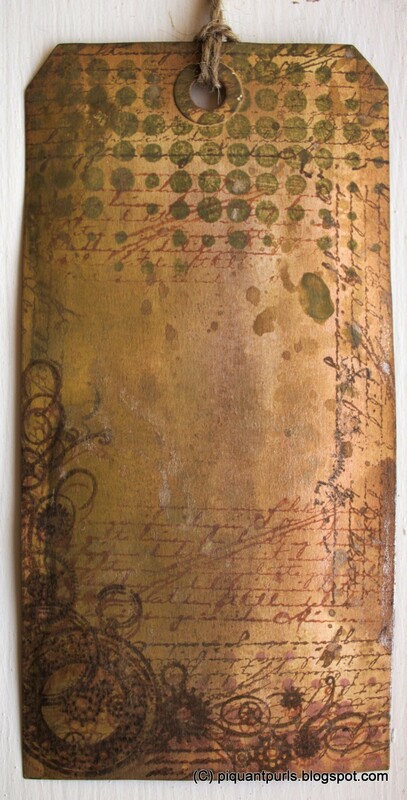 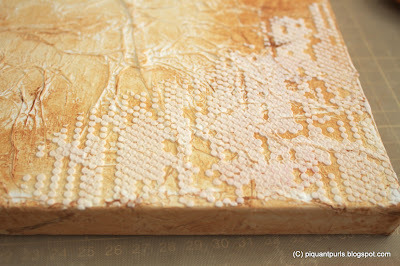 The Spellbinder corners and the numbers are colored with the Distress Paint in Seedless Preserve. 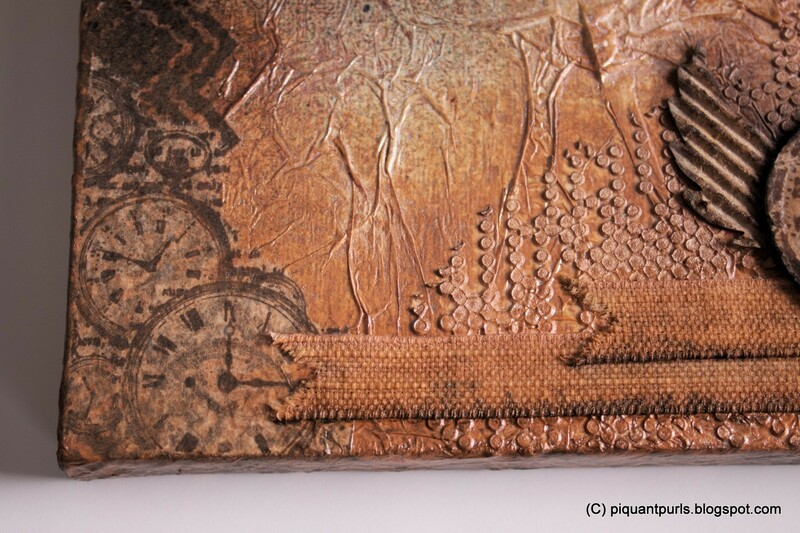 I got some corrugated cardboard from a packaging recently, and I was burning to try it. The papers are from the Prima Engraver 6x6 -pad. Some metal brads and washi tape as embellishments and layering with 3D-pads. Basically everything is distressed from the edges and colored with Distress Inks. 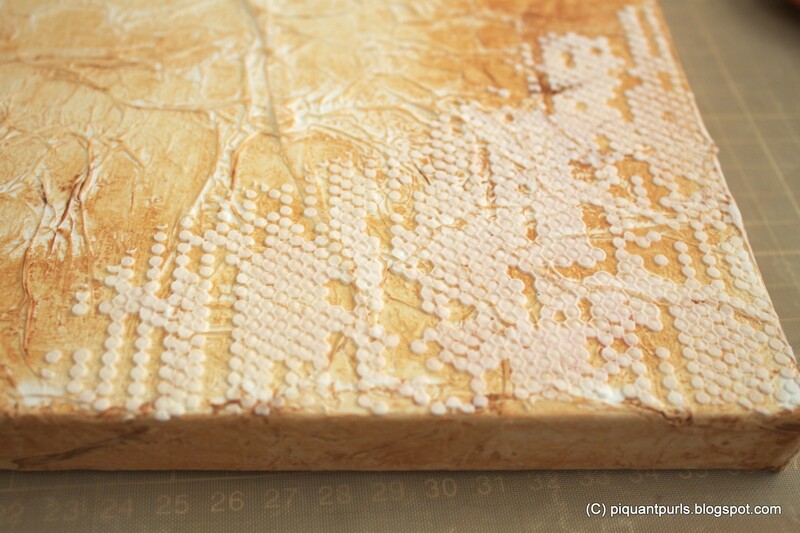 Hamstrasin erään paketin kääreenä tullutta aaltopahvia ja teki mieli kokeilla sillä leikkimistä. 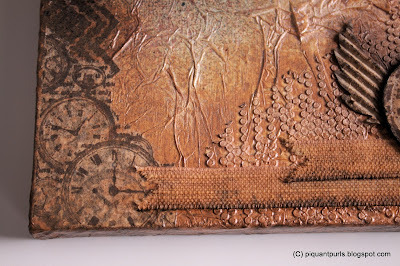 Kuviopaperit ovat Priman Engraver 6x6 -lehtiöstä, lisänä metalliniittejä ja washi-teippiä koristeina ja kerrostukset 3D-liimatyynyillä. 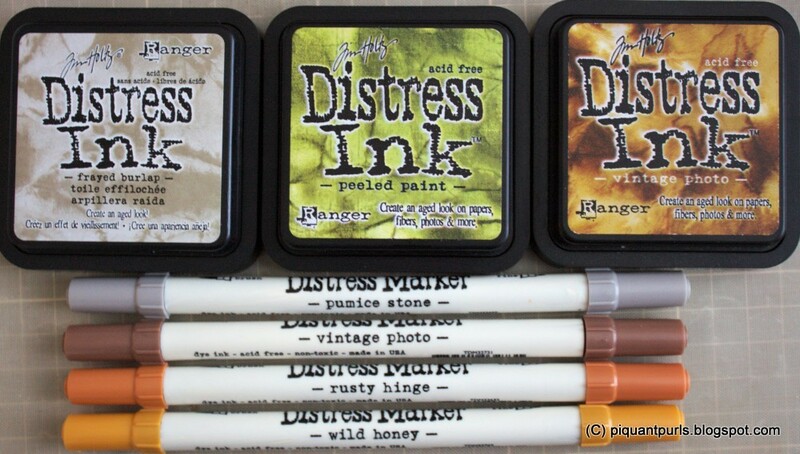 Käytännössä kaikki reunat on ressattu ja väritetty Distress Inkseillä. 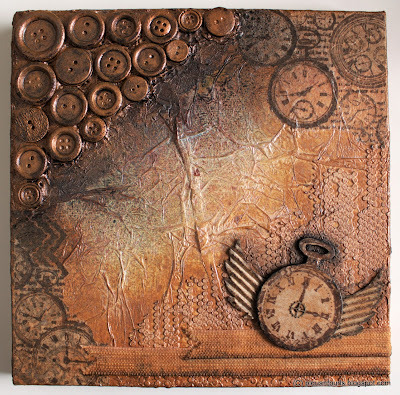 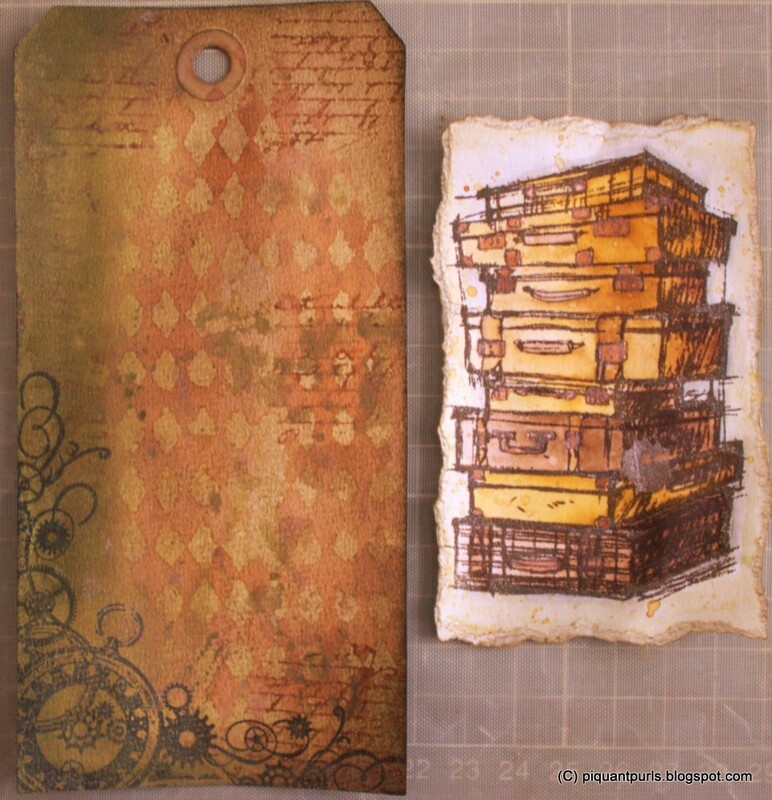 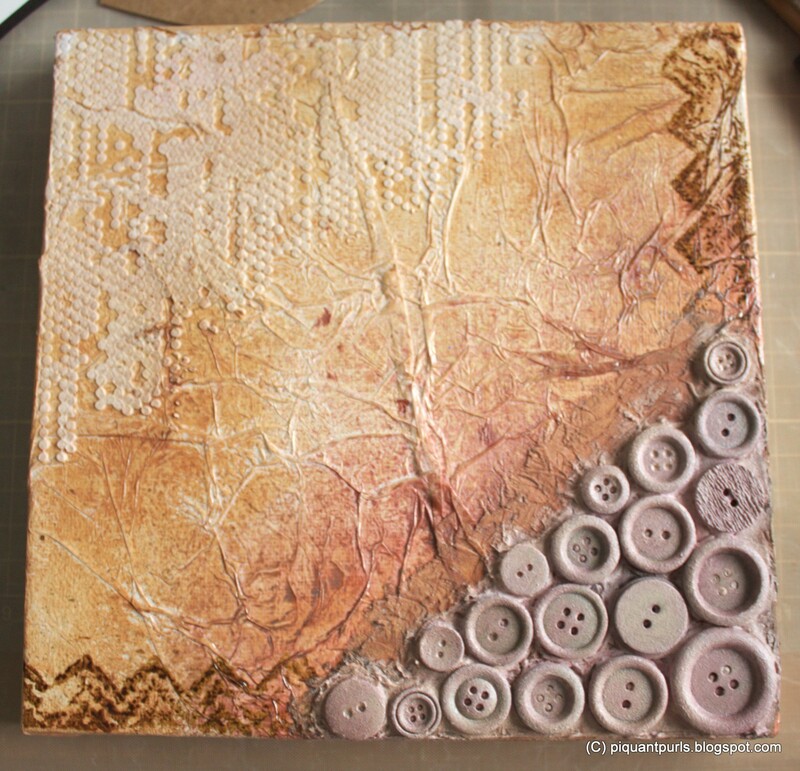 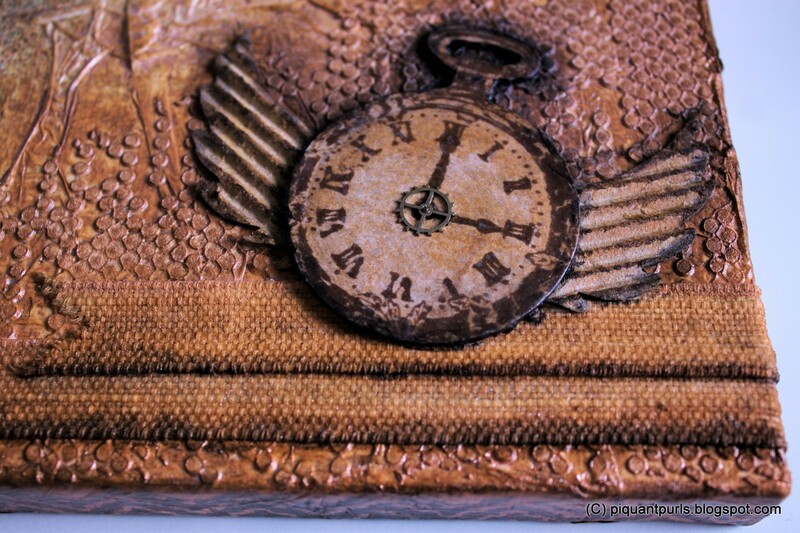 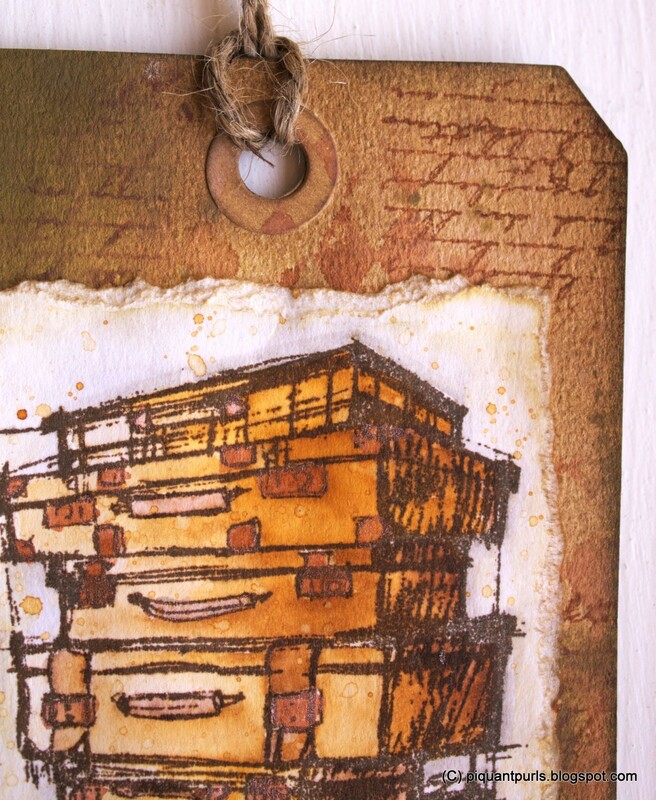 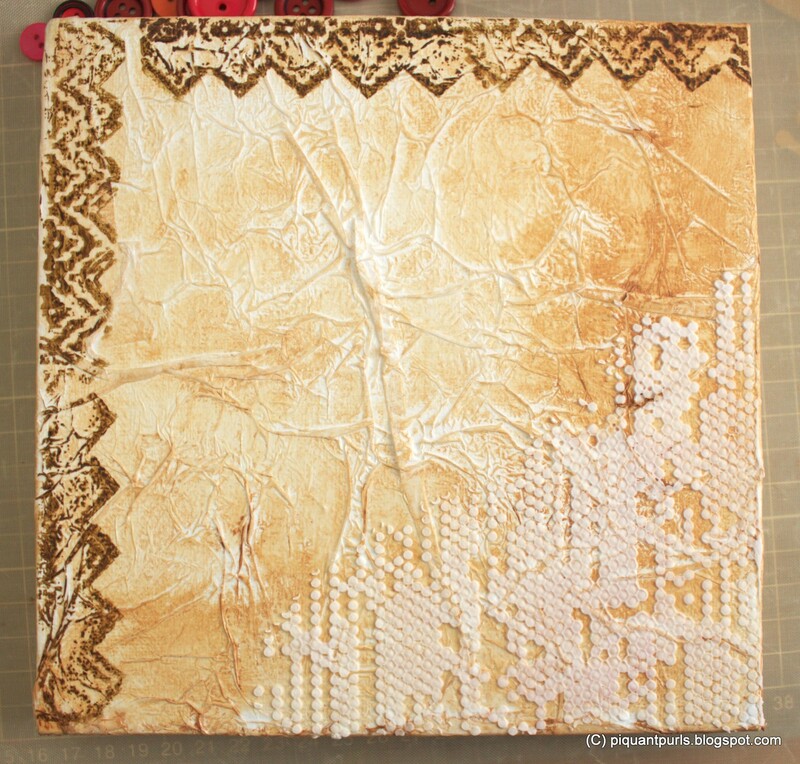 At Tim Holtz's blog there's a 12 tags of 2013 tutorial challenge, which I only recently came across. 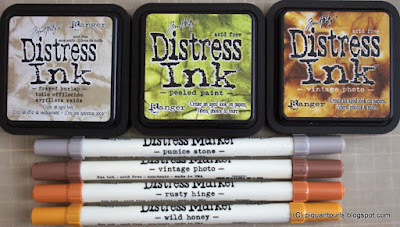 I haven't played much with my Distress-products other than plain stamping and coloring with the ink-tool, so the tag-challenges are a great way to experiment. 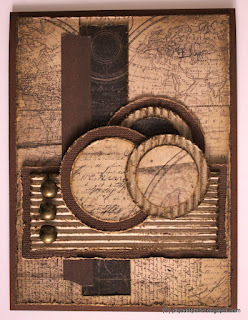 I did the background with Forest Moss (paint), Vintage Photo (ink pad) and Antiqued Bronze (stain). As a stamp I used the suitcase stack from the Time Travellers - stamp set and stamped it with Coffee colored Archival Ink as I wanted a softer look instead of using black. 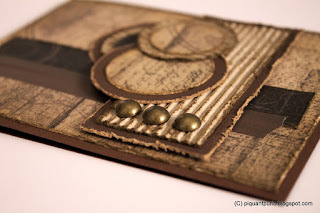 For the background I used Frayed Burlap, Peeled Paint and Vintage Photo ink pads and the Vilda Stamp image is stamped with Versa Fine Onyx Black. 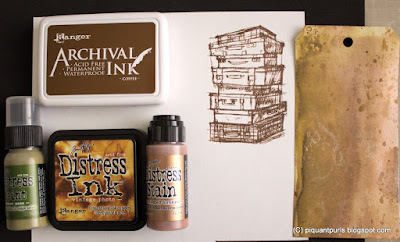 The harlequin background stamp I colored with Rusty Hinge marker - I love the way it turned out and really need to get this color as an ink pad as well! 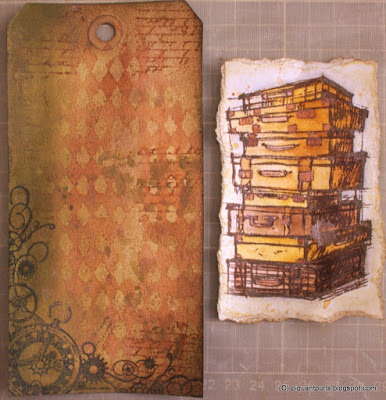 The handwriting stamp is also stamped in with Rusty Hinge. 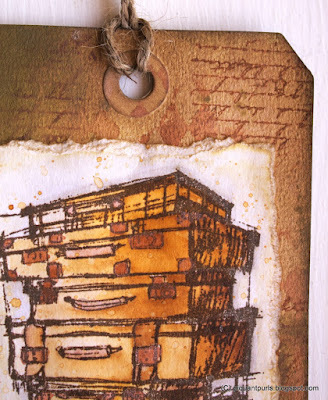 The image was colored with Vintage Photo, Rusty Hinge and Wild Honey markers, with shading in Pumice Stone. 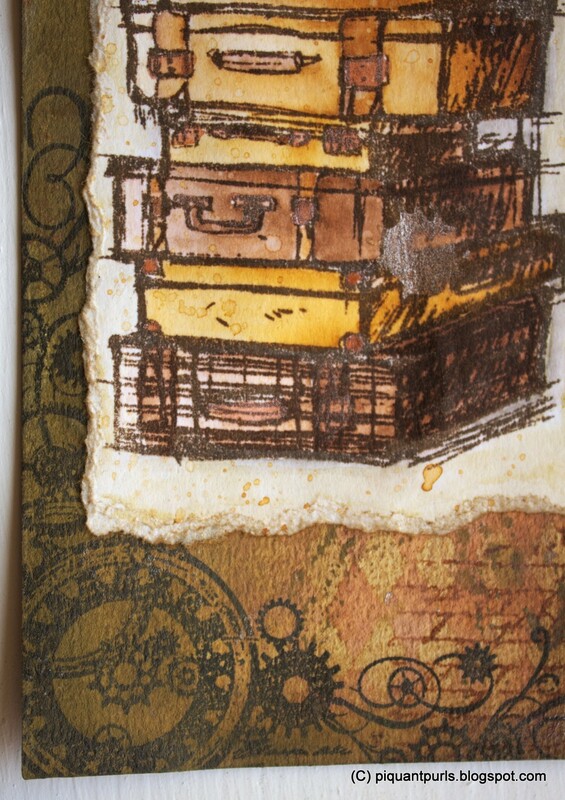 I used my water brush to lift up some Antiqued Bronze paint from my craft mat to color in the buckles and hinges in the suitcases for a metallic effect. 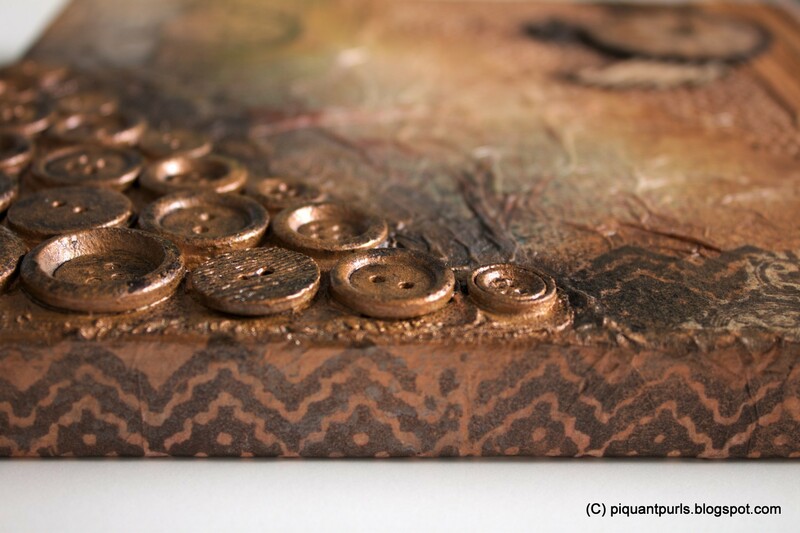 Somehow I also managed to get a huge blotch in the middle of the image - but hey, let's say it's a design feature... 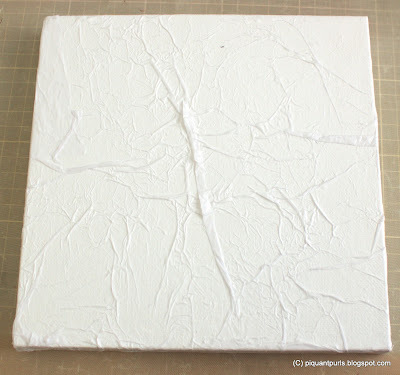 I ripped the watercolor paper from all edges as the image was so large. I stamped the bottom left corner first with the Coffee Archival Ink, and it didn't show up enough, so I decided to do another try with a darker color, and of course they didn't line up at all. 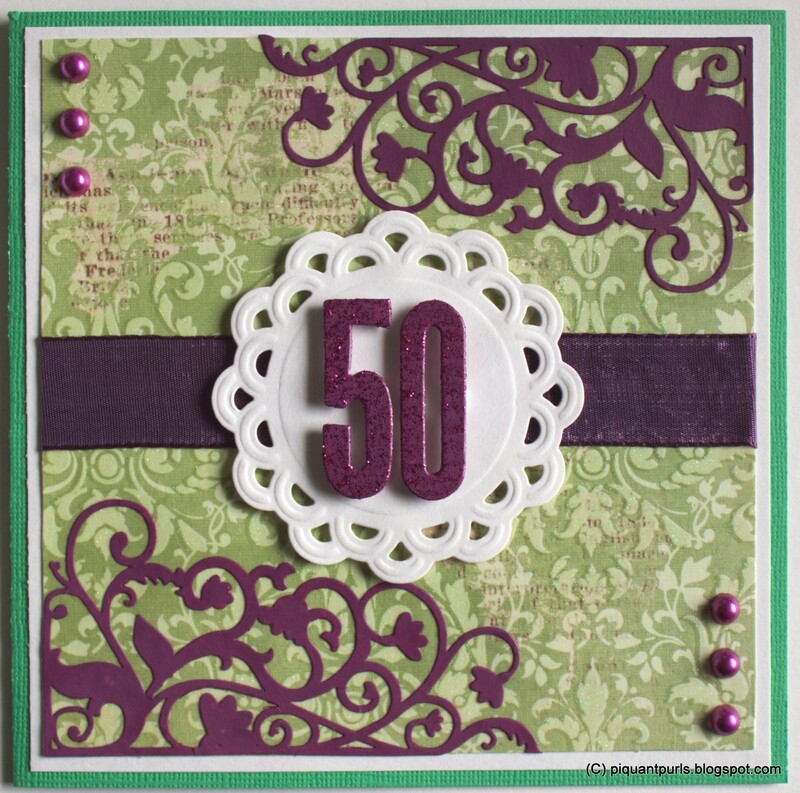 Also the Forest Moss stamping at the top didn't look nice when layered on top with the stamped image. 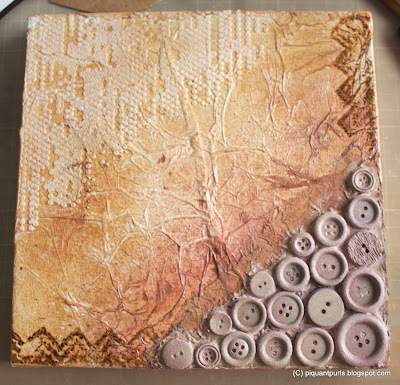 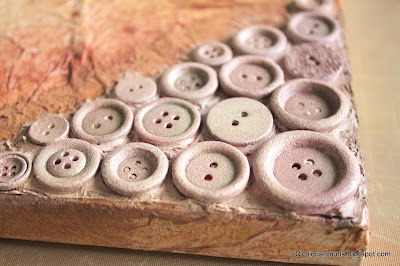 A close-up of the bottom left corner - I really love that stamp from Vilda Stamps! 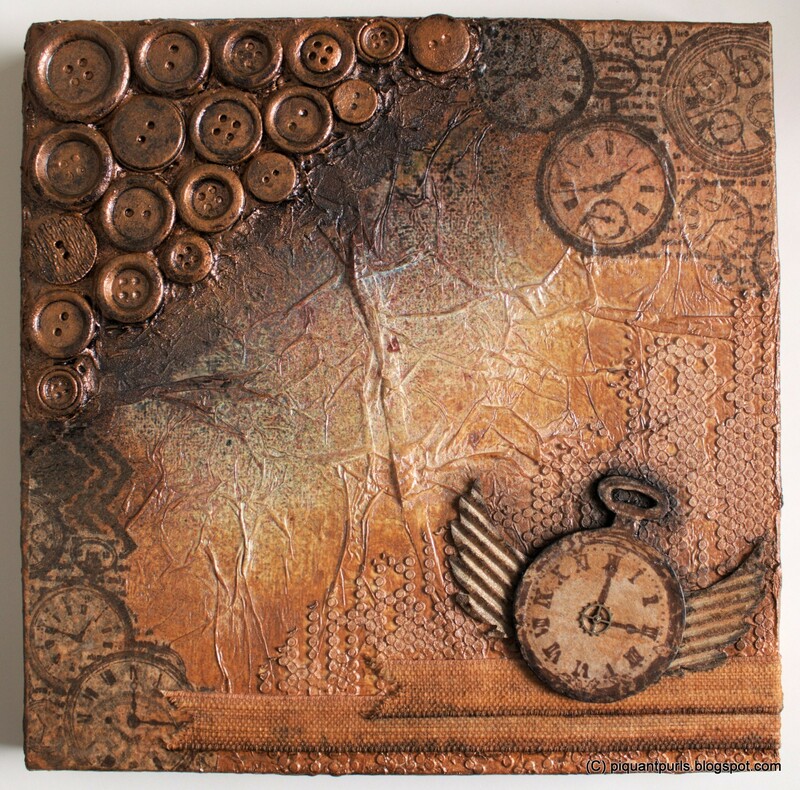 It has clockwork, gears and flourishes all in one.